Cambridge University Press, 9780521357951, 292pp. In recent years philosophers have radically reappraised the importance and sophistication of the philosophical texts of the ancient world. This new series of Companions is intended particularly for students of ancient thought who will be reading the texts in translation but approaching them with the analytical skills of modern philosophy and with an eye to their contemporary as well as their historical significance. Each volume is devoted to a specific field of philosophy and contains discussions of relevant ideas of all the major philosophers and schools. The books do not attempt to provide a simplified conspectus of ancient views but rather critical discussions of the central and therefore representative arguments and theories. A particular feature of the series is its exploration of post-Aristotelian philosophy, which has been shown by recent scholarship to be both philosophically exciting and historically important. 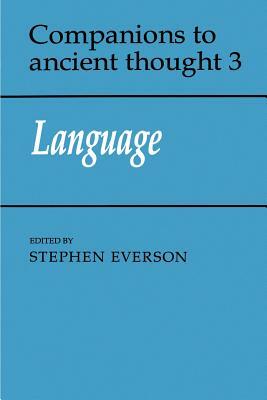 This third Companion is devoted to ancient theories of language. The chapters range over more than eight hundred years of philosophical enquiry, and provide critical analyses of all the principal accounts of how it is that language can have meaning and how we can come to acquire linguistic understanding. The discussions move from the naturalism examined in Plato's Cratylus to the sophisticated theories of the Hellenistic schools and the work of St Augustine. The relations between thought about language and metaphysics, philosophy of mind and the development of grammar are also explored. The essays will interest those studying ancient philosophy and philosophy of language, the history of thought about language, and linguistics.